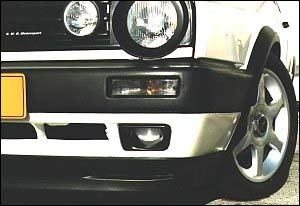 DESCRIPTION SWG has designed an Air Vents which fits into the Mk2 Golf front Big bumper. This easy fit item simply clips into the original bumper ( * No Glue Required * ) where the fog lights would normally sit, an ideal solution for broken fog lights or someone looking to get some more air to the front brakes or just wanting to add a unique look to the front of the car. Simply Clips in ! Easy fitting !